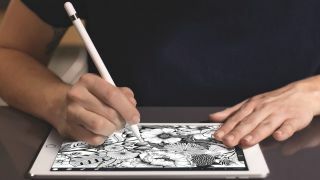 Yes, yes, yes – the iPad Pro's Apple Pencil probably is the smartest digital stylus out there, what with its lag-free input, palm rejection (you can rest your hand on the screen without it being confused for the pencil's nib) and ability to monitor minute changes in pressure. But it was also, in some respects, pretty dumb too. There was nowhere to house the Pencil on the iPad Pro itself, its circular shape meant it would roll off a table, and its Lightning charging port meant you had to leave it sticking out of the iPad like some sort of oversized tablet lollipop in order to juice it. While Apple may yet need to fix that last issue, it seems the Apple Pencil 2 will at least address the first two problems, if a new report from LetemSvetemApplem is to be believed. It doesn't take a genius to guess what Apple plans to do to fix the issues. For starters, as with many third-party case options, it appears Apple will now put magnets into the Pencil to allow it to stick to the side of its tablet, just like the Smart Cover cases. As for rolling off tables, it's supposedly using a tried and tested method – simply popping a clip onto the side of the Pencil, which will stop it rolling and also let it hang onto a shirt pocket. It brings to mind the story of Nasa trying to invent a gravity-defying ink pen for its astronauts, while the Soviet cosmonauts simply brought pencils up to space with them.